Wow, March came and went with a blink of an eye didn’t it? I realized I didn’t get a chance to post my 365 project mosaic from March! I am REALLY enjoying taking a picture every day, it makes you stretch your abilities, try new things and look at things a different way. As I approach my 100th day this weekend, I have to say, I’ve been quite impressed with myself! There’s only been a day or two that I’ve though “ugh, I need to take a picture”…..most of the time I’m excited about it. Funny thing is, the days that I feel the most uninspired and think I have just NOTHING to shoot, are the days I seem to come up with some of my best shots!! Flickr has such a GREAT community of people, who give me support, inspiration and encouragement. They are the reason I keep going!! So how about you guys? 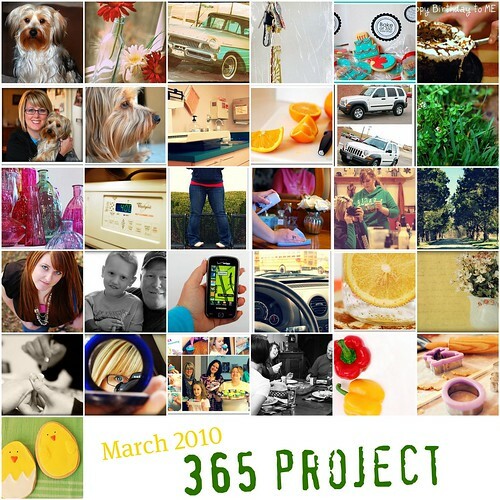 Any of you doing a 365 project? If not, you can start ANY time! If you want to get better at your photog skills, or just want a really neat way to document your year, I encourage you to give it a try!! If you aren’t sure about how to do it, or how it works, just let me know…..I’d be happy to help you out! Blue Cricket Designs – I was THRILLED to swap blogs with Becca here. Bake at 350 – I’m still in AWE of the cookies Bridget sent for my birthday! How Does She? – These 3 talented girls impress me every day! 320 Sycamore – I’m ALWAYS amazed at the ideas Melissa shares! Living Locurto – The talent this woman has is UNBELIEVABLE! The freebies, the downloads, party ideas and have you seen her meal plans? She even has a printable shopping list for each weekly meal plan! You ladies are all AWESOME and make me smile every day! ? Don’t forget to share what you are loving this week!! The linky party starts this evening (Thurs) – I usually have it up around 10PM CST. Not sure what it’s all about? Click here to read more!! Hey, how do you track who the top referral sites were? I'd like to do that by SiteMeter doesn't keep stats like that (well, with the free program at least). A mosaic from every month would make a fun future calendar – I could also see myself creating a 'year in the life' album through shutterfly as well. I, too, was wondering how you track top referrals. March did go by fast! Great pics! Oh I am just so THRILLED…. when I look at your lovely lovely MARCH MOSAIC! Oh…and I am also JEALOUS!!!! and take pics each day! I wish I was TIDYMOM! I wish I could stick to things! I'm an airhead….and have trouble focusing! I'm allllll over the place! TIDYMOM…can you help me to FOCUS!!!! And I can see WHY you are so proud of yourself! Pictures are really getting more and more advanced! I AM doing this next year! I think it's just the greatest idea. Such a good way to get you to look at those everyday things with new eyes! What a great idea. Might give it a try. I LOVE your mosaic with pictures!! I could not love it more. And the picture you have in there are SO beautiful and touching and deep and thoughtful… great job! I love your pictures. Great job with the mosaic! I'm really enjoying doing the 365 project. I wish I were more organized with them though! Your project is wonderful and your photos…wow. What's not to like! Your family dinner table one, the lemon bubbles, and the compact in the car shots are my favs but they are all so darn good. Thanks for posting. I see your 365 every day but it's so AWESOME to see the month in collage form! Those shots of the pup are precious. You make us smile everyday, too!!! Bravo and your 365 project! I'm always so impressed with your pictures!